This week we did rotations for art alive, In room 22 we were learning about Vincent Van Gogh. We had to draw one of his sunflowers. Mrs Nua Told us to star lighten the sunflower and to paint in the short brushstrokes of the Impressionists. Vincent Van Gogh had a rough life in his twenties. but I really like his art its outstanding and his colours are really natural. I really love that picture that you have painted it is so creative. I am really looking forward for some more of your school work on your blog. Great work. 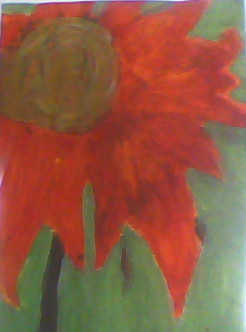 I really liked your painting of part of the sunflowers. I did one of these as well and it turned out pretty good. I also liked your description. It was nice and short. Anyways, keep up the good work.